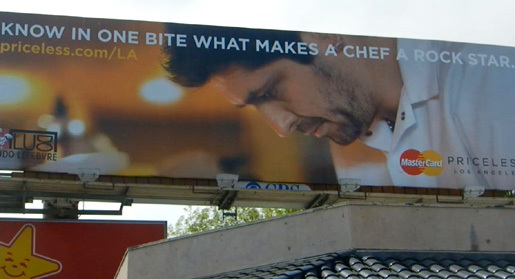 Bland Chicken Strips from Top Chef star Ludo Lefebvre? Say it ain't so, but when compared to KFC and Popeye's Fried Chicken, the Ludo Truck's Chicken Strips are just second banana. Fried chicken, when done right, has moist meat, with a brightly seasoned crunchy coating. While Ludo's Chicken Strips meet the first requirement, it falls short on the seasoned coating. Chicken Strips start with a handicap -- the skin is usually removed, so the crust has to be exceptional. Every order is fresh fried which is a big plus. 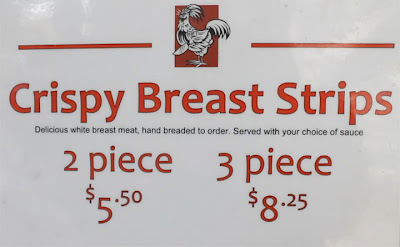 Each nice sized meaty fillet is as good as white meat chicken can be. And the finished product is surprisingly non-greasy for being deep-fried. But the coating is all black pepper with none of the spices that make other fast food chicken so addictive. So you end up with the raw flour taste front and center. 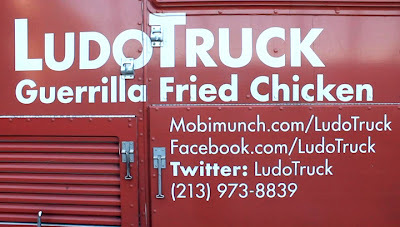 Ludo needs to bone up on Southern fried chicken seasonings, especially if Chicken Strips are your main featured menu item -- or take your fried chicken in a more original and delicious direction. Now the white meat tenders are moist, and is a generous portion, even at $5.50 for two. While the coating is crunchy enough and not objectionable, it's just bland and boring. I expect more from a Top Chef contestant. Chef Ludo has stepped into the too deep end of the fried chicken pool. He should visit more South L.A. Soul Food restaurants and take notes on the crunchy skin of Popey'es Fried Chicken. Even KFC's Original soggy coating is loaded with flavorful seasonings. For local purveyors of fried poultry there's lightly coated Dinah's Fried Chicken (my review here), big crusted Roscoe's House of Chicken and Waffles, or uncoated and succulent Korean fried chicken from KyoChon. These are chicken recipes that have reached fryer perfection. On the plus side I enjoyed the dipping sauces of super hot Spicy Mayo and lemony Bearnaise. 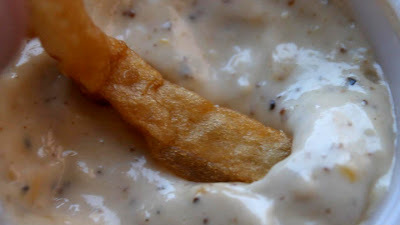 They were so creamy good I used my fries to mop it all up. 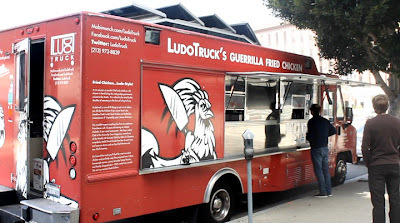 The another item I have tried from Ludo Truck is the French Fries -- and I hate to say it, but no improvement here. You would think French Fries from Frenchman Ludo Lefebvre would be a slam dunk, but they are more like a tiresome foul shot. 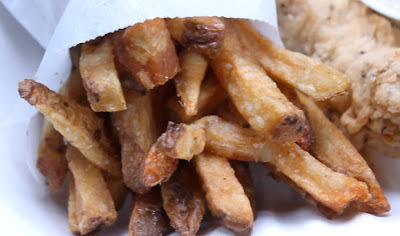 These fries are limp and under-seasoned. Maybe because I am more of a Belgian double-fried crispy fries type (Chef Ludo, you can checkout my recipe video for a better French fry by clicking here.) The Ludo Truck fries are fresh and thick cut, but again they are just okay. 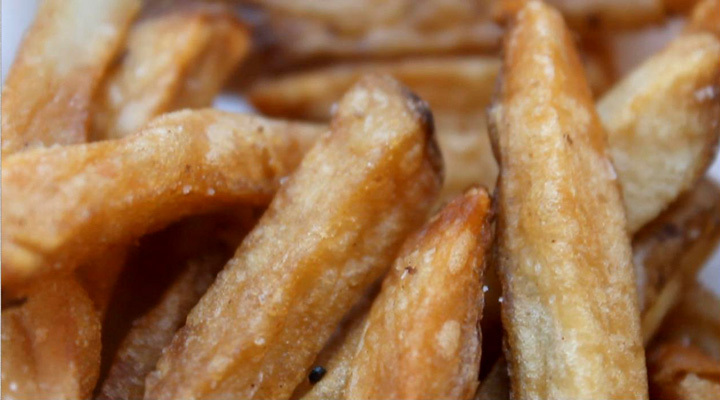 Almost any fast food burger joint makes better fries, even from frozen pre-cut spuds. Hey, I have no beef with Chef Ludo, I enjoy his TV show appearances, the culinary prowess he displays and his fiery French temperament. But I know cheap dining and Ludo Truck's Chicken Strips and French Fries need to be improved for a return visit from this Bottom Feeding Chef. There is a glut of food trucking going on in L.A. and most are overpriced and gimmicky. I've done other food truck videos that show how to make delish cuisine served on four wheels -- just click on any name to see what I mean: Night & Day with the Kogi Truck, A Rainy Day at the Nom Nom Truck, Tacos Leo, El Sabroso Fish Tostada Truck, Border Grill Truck, and El Pique Taco Truck. 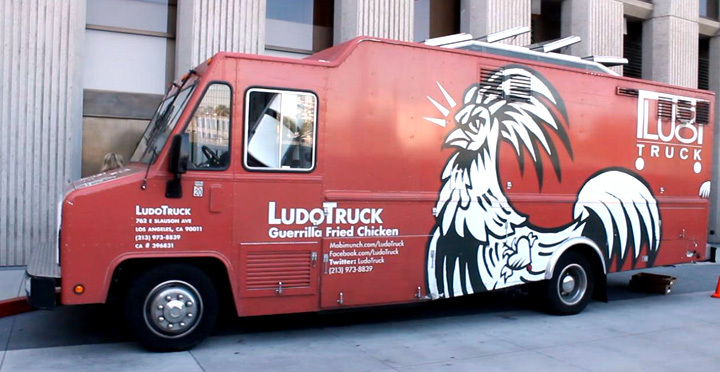 The Ludo Truck also sells Chicken Wings and Boneless Chicken Thighs. I recently tried the Chicken Wings, which I prefer over the Chicken Strips. 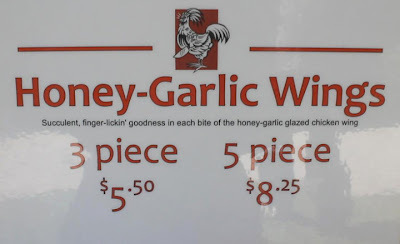 Three large uncoated wings are deep fried and come slathered in a sweet garlic sauce. 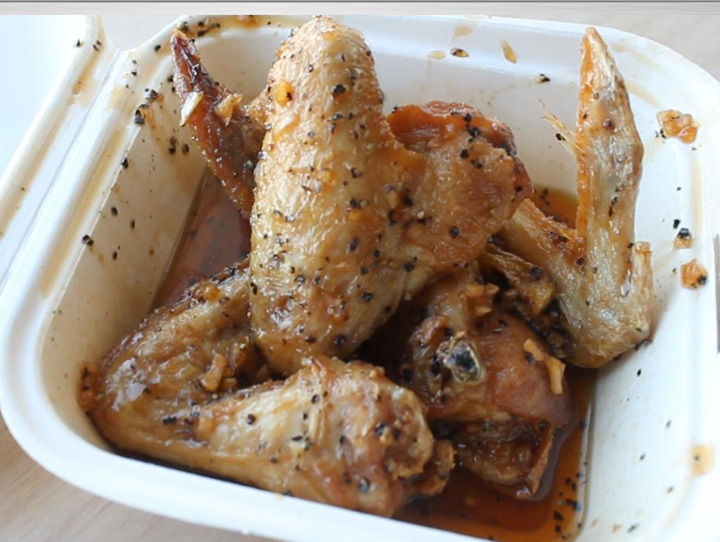 The wings are fried perfectly, and like dark meat are moist and tender. Every time I've been to the Ludo Truck they are out of Boneless Chicken Thighs. I'll update this post if I ever get to try them. So check out my Cheap$kate Dining Video below to see the rating of 1 to 9, 9 being best. And the last shot of my Cheap$kate Dining video review features an outrageous ending where foul-mouthed Chef Ludo gets in the last word! Play it here, video runs 3 minutes, 18 seconds. 99 thanks to my neighbor Pete for his camerawork. 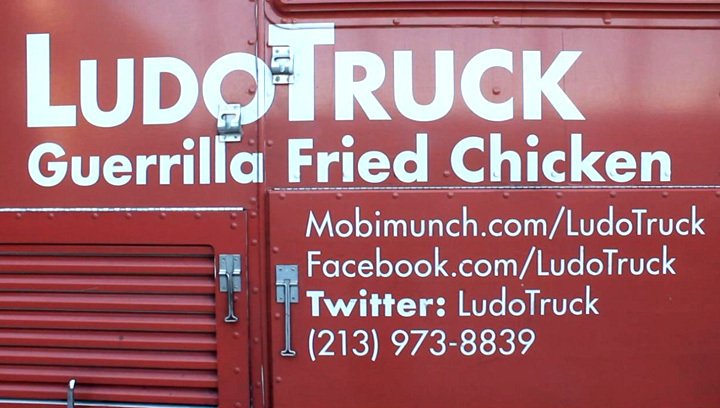 Extra 99 thanks to the cooks and order takers on Ludo Truck. The food was well presented and everyone was quite pleasant. I saw many diners enjoying their chicken, so don't let my review cause pause -- give them a try and decide for yourself. 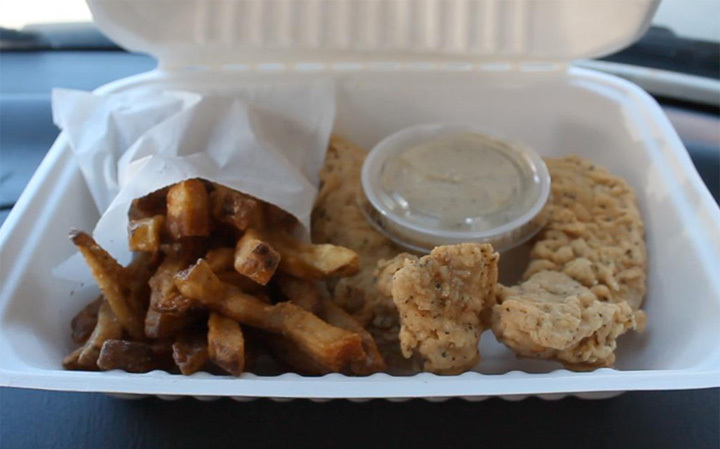 Chef Ludo's Chicken Strips and French Fries are fine for fast food dining. Oh no! Say it ain't so! A world famous chef is ruining fried chicken?@? @ WTH!?!? I should go to his truck with a bag of MY fried chicken and start whacking them over the head with it. It makes me want to cry.